American audiences didn't get to see it until ten months later (and only then, after one of the most legendary "word of mouth" campaigns in cinema history). In case you've never seen it before, this movie has nothing to do with the country of Brazil (apart from the theme song ""Aquarela do Brasil"). 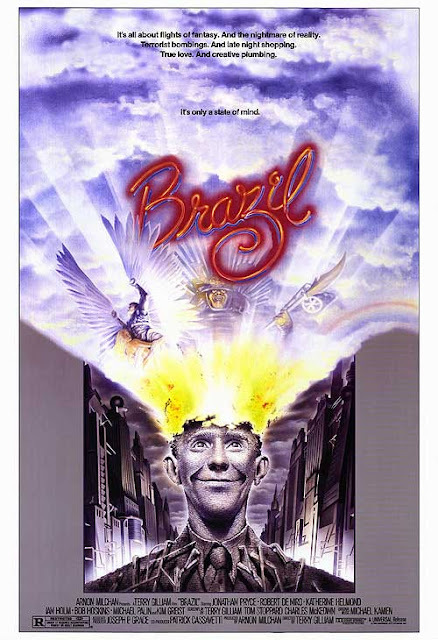 Set "Somewhere in the 20th Century", Brazil is the tale of Sam Lowry (played by Jonathan Pryce), an employee in the lower tier of a government so overly-bureaucritized that it's been called everything from satirical to prophetic. Lowry seeks escape from the tedium of his existence in wild daydreams of rescuing a beautiful maiden. And then his fantasies begin to intersect with waking life after a paperwork snafu at the Ministry of Information sets in motion a series of chaotic events that leads him to the very real Jill (Kim Greist). Also thrown into the mix is Archibald "Harry" Tuttle, a renegade heating and air conditioning repairman (played by Robert De Niro, in what has been praised as one of the finest roles of his career). One could spend way too much time writing about Brazil and its many themes. Gilliam's desire to convey desperation to escape from modern life (along with Time Bandits and The Adventures of Baron Munchausen, Gilliam considers Brazil to be part of his "Trilogy of the Imagination"), government power run amok, people too fixated on materialism and vanity ("Consumers for Christ"? There's gads of commentary in just those three words), the list goes on. It's a very difficult movie to describe, if you haven't watched it yet. Twenty-five years later and Brazil has not only gotten better with age, it's now more relevant than most films in recent memory. And indeed, it's one of the rare films that seems to get better with each new viewing. So happy twenty-fifth anniversary to Brazil! And no offense meant, but here's to praying that the next twenty-five years don't bring this movie any closer to reality. "We're all in it together kid!"